Wireshark is the most famous protocol/packet analyzer on the market! Almost every engineer uses Wireshark for troubleshooting network/application issues. Keeping a history of what happened: Most degradations are reported after they have taken place. Most performance degradations are non-continuous/intermittent phenomena and cannot be analyzed any time you want. To perform a diagnostic of a performance degradation, you must have a historical view of performance. Wireshark is based on packet analysis and it is unfeasible to retain several days of network traffic to be able to diagnose what happened. 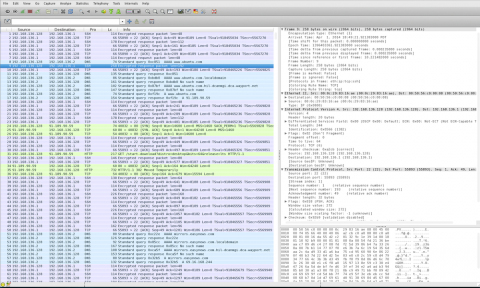 Wireshark shows packets in a very deep way … but does not provide clear information about transactions (e.g, URL, SQL operations) and their response times. Every item information of that kind has to be calculated manually, taking an enormous amount of time for every transaction that you would like to analyze. If you had the chance to have all that data available, proper feedback from your users, and some luck… you would still need tens of hours to have the information that you could have in one minute with SkyLIGHT PVX. What SkyLIGHT PVX does is to automate the calculations that you would perform for one transaction and apply them to hundreds of millions of transactions each hour. No need to uninstall Wireshark, it is definitely a great tool. However, it may be worthwhile taking a closer look at how you could benefit from combining it with a solution such as SkyLIGHT PVX to take your troubleshooting capabilities to the scale and complexity of your IT organization now. As Director of SkyLIGHT PVX Product Line and Business Development, Boris is responsible for leading innovation around Accedian’s network and application performance solutions for enterprise IT. He applies more than 15 years of IT operations, network, and application development experience to advise organizations across all verticals on best practices to optimize performance in multi-cloud, virtualized, and software as-a-service (SaaS) infrastructure environments. Boris holds business law and economy & finance degrees from EDHEC Business School and Institut d’Etudes politiques de Bordeaux.